Soda ash or sodium carbonate is a water soluble sodium salt of carbonic acid bearing the formula Na2CO3. It is a strong alkali which is white , odorless and possessing hygroscopic properties. 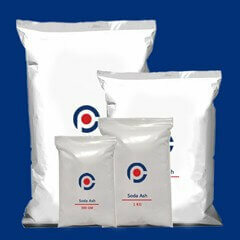 Soda ash is commonly known as washing soda and as the name suggests its use is in laundry. Soda ash is a must have product at laundry room as it is widely used for domestic cleaning. If you are not able to figure out where to buy soda ash your easiest access is to buy soda ash from online shop, not to rule out the fact that they are also available in quiet a few grocery shops in India. Soda ash manufacturers are present in almost all countries as its use is spread across both domestic and commercial areas.In India you can buy soda ash at ibuychemikals, for you have the advantage of buying in small amounts with best quality. If you are wondering about soda ash price, its quiet not expensive and at ibuychemikals you can buy them at best price they are available in quantities of 500 gram, 1 Kg, 5 Kg & 20 Kg. Quality of packaging is really nice and very good quality chemical.